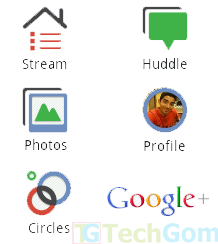 In the previous article on the Google Plus we saw its features and how it differed from Facebook. Now let us take a glance at its android application. With the help of the Google+ application sharing becomes much more easier and efficient as you could be connected with your circles on the move. This is what you will see once you sign in into the application. The app has a quite nice user interface, you can have an access to your Stream, Photos, Circles, Huddle, Profile. There is a notification tray at the bottom which you can drag to see your notifications. Stream is something that is similar to the news feeds in your Facebook android application.You can share your thoughts with your mates i.e. the status update. You can even share your photos and add location to your posts. Basically in streams you get all updates about your circles in streams in form of status, pics, video or links. Photos section of Google+ app is really impressive, whatever pics that you click on your phone are automatically uploaded to your Picasa album, later you can share them through the app (if you want to) with your circles. This feature is called instant upload. To enable it go to your Photo section. Go to settings, in settings there is an option of "Instant Upload". Below which is the "Upload Status", which shows you the instant upload status. Here you will get various options to suit your needs of sharing photos or videos, for example "Photos and videos only via Wi-Fi" enabling it whenever you are on Wi-Fi all your videos and photos will be uploaded ready for you to share. This makes photo sharing very simple and handy. This feature will come for iOS devices soon. Circle helps you share right type of information with right kind of people. You can organize people into various social groups here. This helps you share an information with related social group or circle. For example,you can create a group Android, wherein u can share all stuff related with android. This increases your privacy with people. Huddle is a group messaging service. This is a text based conference ,wherein people can be added for a group discussion.For example if you want to go for dinner with your friends then you can communicate with them through huddle wherein all can share their thoughts simultaneously. This is equivalent to the Facebook groups. Overall Google plus app is nicely designed by Google and has good features.Google plus is trying to gain maximum popularity among people, but as of now it is too soon to say what impact it can have on Facebook.